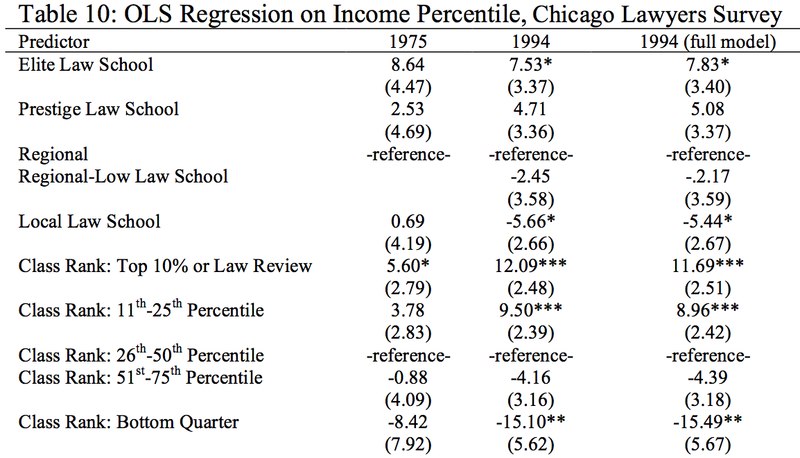 This detailed study concludes that law school grades, not prestige, have the strongest correlation with career success. I'd be interested in reactions from attorneys to these results. See earlier post credentialistm and elite performance, and links therein. Compare to success of graduate programs in physics in placing theoreticians. Of course, since there is significant error in the measurement of law school grades, these models almost certainly understate their full impor- tance.38 Moreover, since we are here considering long-term career outcomes – not short-term recruitment – the effect of law school performance is not simply a credentialing effect of high grades leading to attractive job offers. Something about doing well in law school is strongly associated with lasting career success, and proves to have more efficacy than law school eliteness. The eliteness of one’s law school is, compared with grades, a relatively weak explanatory factor in the 1994 equation. 39 And while the grade coef- ficients are biased in a way that understates their actual influence, the law school coefficients are almost surely overstated. The Chicago Lawyers equations do not include measures of pre-law credentials, such as LSAT scores and undergraduate grades. 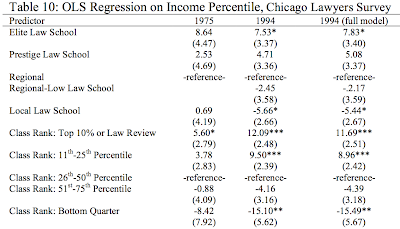 Since these factors do predict income for broad cross-sections of lawyers, and since the tight hierarchy of law school admissions makes law school eliteness a close proxy for student credentials, an unknown but probably large part of what seems to be explained by school eliteness is actually just a measure of pre-law credentials. Is it possible that there are two paths to high income legal careers: BigLaw (BL) and RegionalLaw (RL)? Perhaps LS prestige is a big factor for the former and less so for the latter, which draws from regional schools (i.e. state flagship campus). Top partners in RL might make almost as much as those in BL, so that grades (which predict both BL and RL success) have a higher income correlation than LS reputation alone, which only manifests in BL. The utility of grades or class rank as predictors does not surprise me, as they measure a combination of ability, willingness to work hard, and motivation. See here for results on high school GPA and SAT as predictors of college GPA. However, some fields seem to have ability thresholds that can't be surmounted through hard work. I was top 10% at an "elite" law school and made partner in Biglaw. My experience is that grades are a far better predictor than law school prestige. Interestingly, my firm's hiring process has different grade cutoffs for different schools depending on their eliteness (e.g., top 1/3 at HYS, top 20-25% at rest of top-14, top 10-15% at rest of top 25, and #1 at the local 4th tier school). In law, there is a minimum intellectual threshold, but it is not very high (except in rare cases, IQ over 130-140 has severely diminishing returns). Capacity for working hard, enduring boredom (or being interested in inherently fairly dull material), along with some intelligence, is sufficient for technical adequacy. To make partner or be a successful partner, social skills (principally for developing business, including keeping existing clients) are actually very important, and much more important than that 3rd or 4th SD of g. In litigation practice, advocacy and oral skills -- along with the aforementioned social skills -- are also more important than super-high g -- one of my firm's most renowned litigators came from a very lowly ranked school (but probably did very well there). My experience with students from HYS is that they are often lazy and have serious entitlement issues. Students from regional top-25 schools or even top-50 schools come in with much more hunger and more desire to work hard. However, of course there are lawyers from HYS that are hungry and work very hard, and they do tend to be successful. So, I'd say that in the top ranks there are disproportionately more people from elite schools, but not as many as one might expect (if g were more or less proportional to success), and someone who worked hard and did well at a top-25, top-50 kind of school has much better prospects than one might expect from their (assumed) inability to enroll in a more elite school. They're always counterexamples. A family member was unexceptional in college, graduated law school and became both a millionaire (as a practicing attorney, and an adjunct law professor) and retired as a ranking general two steps from the President. According to blogger Half-Sigma if this was the case in 1994 it isn't any more. "since we are here considering long-term career outcomes – not short-term recruitment"
Huh? Don't these guys know that in the case of law these results are the same. Aren't they? International and regional firms hire recent graduates only. If you've been practicing for a while you'll never get in. My own father graduated in the top 10% of his regional law school and did his UG at Harvard. He was always poor. It may be an advantage, but not a virtue, of the almost unique American system of determining the quality of degrees with grades rather than cummulative exams, that grades are more loaded with "capacity for working hard" while cums are more g-loaded. But it all depends on what "capacity for working hard" really means. It's been my experience that the "capacity for working hard", like all other psychological traits, depends on the circumstances and is not an absolute trait. Some people are very hard working at some things and under some circumstances and very lazy at others. Grades reward those who care about their grades, those who are motivated to work hard by this caring. I think the term "capacity for working hard" can be rescued by applying it to situations in which a person is actually disinterested in a subject and naturally lacking motivation. Maybe "perseverance" would be a better word. I agree very much that one man's "hard work" is another man's fun and pleasure. I often wonder about how much perseverance is involved for the most successful people in their respective fields. From personal experience I know that it's rather easy to make an impression of being a hard-working person on other people while in fact just being strongly engaged in an effortless and enjoyable activity (which is rather unfair to those people who really persevere). I remember a partner at Meredith Connell, a large litigation firm in New Zealand, telling me that partners were often B students, but had strong social skills. Although to get hired by one of the 'Big Three' firms, Bell Gully, Chapman Tripp, or Russell McVeagh you need to be doing honours, or at least have a GPA high enough to undertake honours. Thinking of people from my High School, the guys who were Dux in 1994 and 1995 are one level below partner at Chapman Tripp & Russell McVeagh. However, the Head Boy from 1996 has already made partner in the litigation team at another large firm which would be the NZ equivalent of Big Law. He graduated with Honours, but isn't quite as strong academically as the other two. But he is an excellent networker and public speaker. While Yale has "grades," they aren't translated into a GPA or class rank, and there's no curve (i.e. it's almost impossible to fail). As with the rest of academia, law school admissions can be, within a range, quite random; people accepted into Yale are sometimes rejected from Harvard or Stanford, despite Yale being more competitive and selective by almost any objective standard. I can certainly believe these results. Law attracts a lot of people with only a very marginal interest in the field, people with strong UG credentials who lack well-defined career goals. I would go so far as to say that this describes the majority of student at top-five schools. And even though law is considered a sell-out field, anecdotally, I would say that most people at the aforementioned T5 do not matriculate with the single goal of making a large sum of money; more common are vague ideas about working in politics, locking up bad guys, or having some sort of versatile, all-purpose credential (which a J.D. is not). These people are almost always totally disillusioned by the end of law school, and drift into BigLaw simply to pay back loans. There's a high burn-out rate to be sure. The dreams-of-the-young-being-dashed-against-the-rocks-of-reality phenomenon is hardly confined to law, of course, but for whatever reason law is especially polarizing and embittering. I would definitely bet on the guy who grinds out a top performance at a decent-but-not-spectacular school over the girl who parlayed a love of English literature into a Harvard Law acceptance. My roommate went to Boalt. When he interviewed at top law firms they looked at everything, GPA, LSAT, etc. Suffice to say that if your grade is poor, you are screwed. No elite New York law firm would hire you. Undergraduate institution matters too. He went to Harvey Mudd and studied EE. When he went on interviews, the firms asked how prestigious HMC was compared to MIT. He transfered to Boalt after being the number one student at Santa Clara University for the first year. If he had not transfered to Berkeley, he would have zero chance to interview elite New York law firms. Unfortunately he made the fatal mistake of enrolling law school before fulfilling his ROTC obligation. Fortunately things ended up well for him He is now a partner in a San Diego law firm, practicing intellectual property law. His law school classmate ended up better, becoming a partner in an LA firm, writing paper with Morgan Chu, Steve Chu's brother. Part of the dilemma is that there appears to be no control for extrinsic (to the individual) factors. It would also be a nice check to look at physiological individual factors, e.g., height, health, family background, etc. Perhaps the term we are looking for is "willing to put effort into something that is not enjoyable in and of itself". While I would concede some base difference between peoples ability to do this, I think the greater question that determines motivation is "why". Why should I do this thing I don't want to do? If someone has a sufficient answer to that question, then they will work hard. If they don't, they won't. People often use money as the reason, but beyond a certain threshold money in and of itself is a poor motivator. Maybe its I need money to send my kid to private school, but in that case the use of the money is very integral to the monies importance. If you don't have a child, such a motivation won't matter to you. Looking back at grades in particular you often have to do lots of things you don't like to get good grades. Sometimes the motivation is something like, "I want my peers and parents to respect me." So that gives you the motivation to work hard. But what if you grew up in a prole neighborhood and your peers and parents valued doing well and sports and didn't care about school. Then maybe you wouldn't "work hard" at school but you would work hard at sports. Then there is ability. Let's say you are low IQ and low coordination. Maybe it doesn't pay to work hard at much of anything, because the amount of effort relative to reward is so staggering its just not worth it, given current incentive structures. If your going to be average IQ at Harvard or above average IQ at top 14 which do you enroll at. That's the actionable item here right? Do you shoot for top 10% at an "easier" school or just getting a degree from Harvard. My guess is that its a better strategy to enroll in Harvard. A good friend of mine from high school scored in the mid-1100s on his 1991 SATs. He went to VMI and studied mechanical engineering and graduated with a 3.x (0<=x<=5) GPA and after losing his flight billet in the Marines (vision), he joined the Air Force to be a Civil Engineer (1995). In 2010, he pinned on Lt. Col., two years below the zone, two years before most of his classmates will have their first legitimate chance to pick it up. He did his Pentagon tour and spent the first two years telling me how swamped he felt because everyone in DC is a player. He felt like he had to spend an inordinate amount of time trying to figure out their angles. He said to me, only half-jokingly after his junior year of college, "Son, you have no military bearing whatsoever." And that is where he is exceptional. He knows where his limitations are, but he is able to organize and mobilize people. He has enough cognitive capacity to see the barriers and enough social savvy organize an assault. (And I will add as a caveat, that the military is very organized and highly susceptible to 'organizational leadership', so I'm not saying that it is all him). So the question your post has me wondering is about the dimensions of 'capacity'. You are looking at cognitive capacity and conscientiousness in your student studies. Can you frame them to be more ontologically independent, as some intrinsic capacity versus some extrinsic capacity?